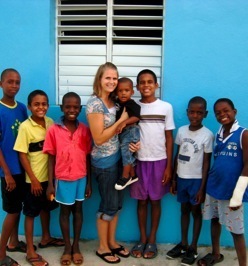 Rebekah is a missionary living and serving in Monte Plata, Dominican Republic through Kids Alive, International. She serves in an orphanage and affiliated school nearby. As you’ll read in her own words, she understands living in difficult circumstances. But she also has a beautiful perspective on how all of us have something to give. Recently she shared with us one of the most inspirational and encouraging stories of generosity we have ever heard. The efforts of her students to raise money for a well in Africa are both humbling and joy inducing. We hope you are as moved as we were by what she and her friends in Monte Plata have accomplished. Giving out of poverty…grace abounds. Yo quiero beber de agua de vida. 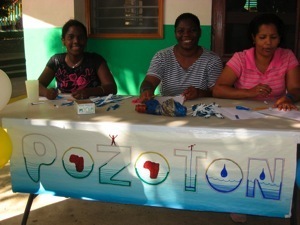 ¡Yo quiero beber del agua del POZOTÓN! Every 15 seconds, a child dies of water related illness. Stop and think about that for a minute. Really think about it. Every 15 seconds, a child dies of water related illness. Someone’s little boy, little girl, brother, sister- gone. And it could be so easily prevented. To me, that reality is completely unacceptable. 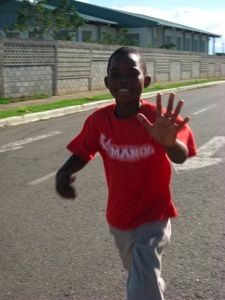 Thankfully, there is something we can do about it– Something even the impoverished kids of Monte Plata can do. Our kids may not be rich here. Many of them fight the daily reality of parasites and the inconvenience of having to look for water. I don’t want to make light of that truth, but on the other hand, their poverty is not as extreme as in other parts of the world. Yes, they have to look for water, but the journey typically takes less than 15 minutes. For many of them, their family buys purified water to drink. They have clothes, a house, at least one meal a day, free medical care and access to an education. Now, being blessed, we want to give them the opportunity to reach out to those in even more dire need than they are. Our kids may not have much money, but God has blessed them with incredible athletic ability. In the style of a jog-a-thon, the kids are going to use their talents of running, throwing strikes, and shooting free-throws to raise $500 to help build to a well at a school in Africa, helping hundreds of families with 10 years of clean, accessible water. The school shook to the feet stomping, drum beating, güira scratching, tambourine shaking, animated singing as the kids of EMR raised a raucous in preparation for the afternoon’s Pozothon. After months of planning, fundraising and enthusiasm building activities, the kids were ready to do their part to help drill a well for a school in Africa. 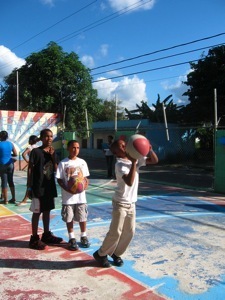 Finally, the time came and more than 60 kids, ages 10 – 16, showed up to run laps, pitch strikes, or throw free throws. 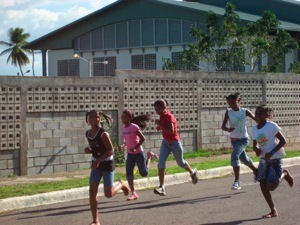 We divided into 3 groups- two at school, and the runners heading over to the multi-use area to use the track. For 30 minutes the students went to work, using their talents for the benefit of those in even more desperate situations than they experience. It was a hot, humid day. The basketball players began fussing because of the the burning sun. The runners, many of which were barefoot so as not to ruin their only pair of shoes, complained of the hot asphalt and rocky ground. 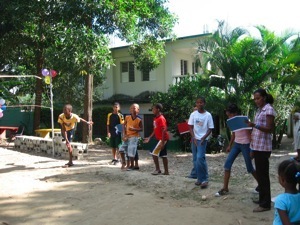 The baseball players– well, they were just having fun 🙂 But even when the kids were uncomfortable, ESPECIALLY when they were uncomfortable, we were able to remind them of the kids they were helping– children who have to face hours upon hours walking barefoot in blazing sun just to provide water for their families. The discomfort of the event helped make the purpose of this project more of a reality in the lives of the participants. At the end of the activities, we celebrated with bottled water for each of the kids and a reminder that the real miracle would happen the following week when we went back to the community to collect the pledges folks had made to sponsor the kids. We had a goal of $17,000 pesos– about $500– an unfathomable amount. But our God is bigger than poverty. He is bigger than any doubts we might have. When we finally went to collect the funds, we found that He had provided more than $20,000 pesos for a total of $568! Not to us but to His name be the glory! So many lessons were learned from this project. Lessons about world poverty, lessons about being blessed to be a blessing to others, lessons about serving others with hard work, lessons about using talents for God’s honor, lessons about God’s faithfulness and mightiness. But the main lesson that I pray our kids walked away with is that of Water. Not water to drink or with which to bathe, but Living Water. Living Water that can cleanse us from our sins, wash us clean, make us pure before God. Living Water that fulfills our deepest thirsts, regardless of our physical state. May our children here in Monte Plata learn to thirst and yearn for that water, and may the children who receive the water from the well also learn to drink deeply from the Wellspring of all life. We are blessed to partner with Rebekah and the children of Monte Plata. Soon we’ll be sharing their story with students in Kenya who will drink clean, safe water thanks to the generosity of children just like them. Stay tuned…this story gets even better.